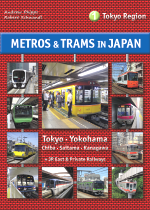 Click on map to expand to full Yokohama area! 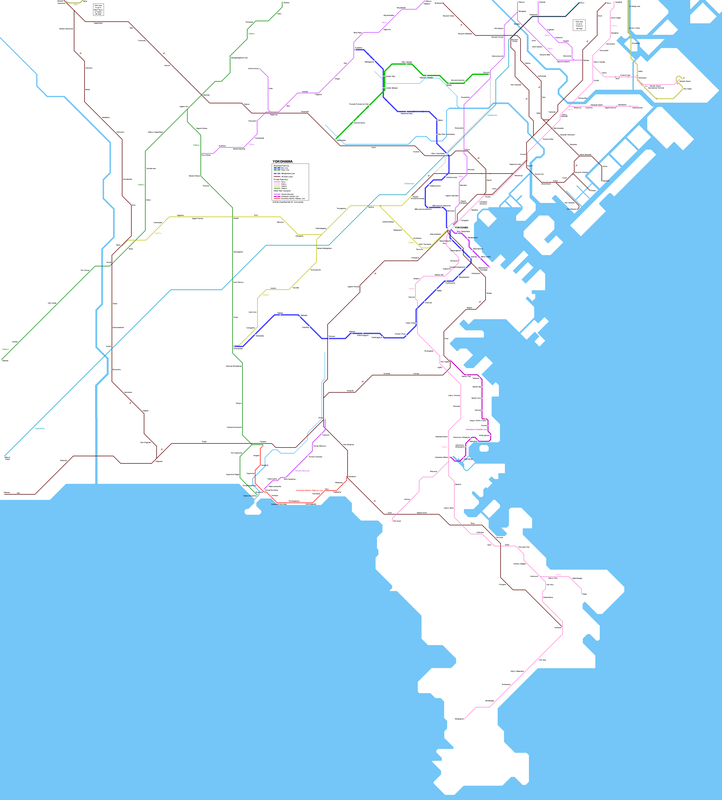 Yokohama has 3.4 million inhabitants (second largest city in Japan) and is situated on the south-western shore of the Tokyo Bay, only 30 km from Central Tokyo. 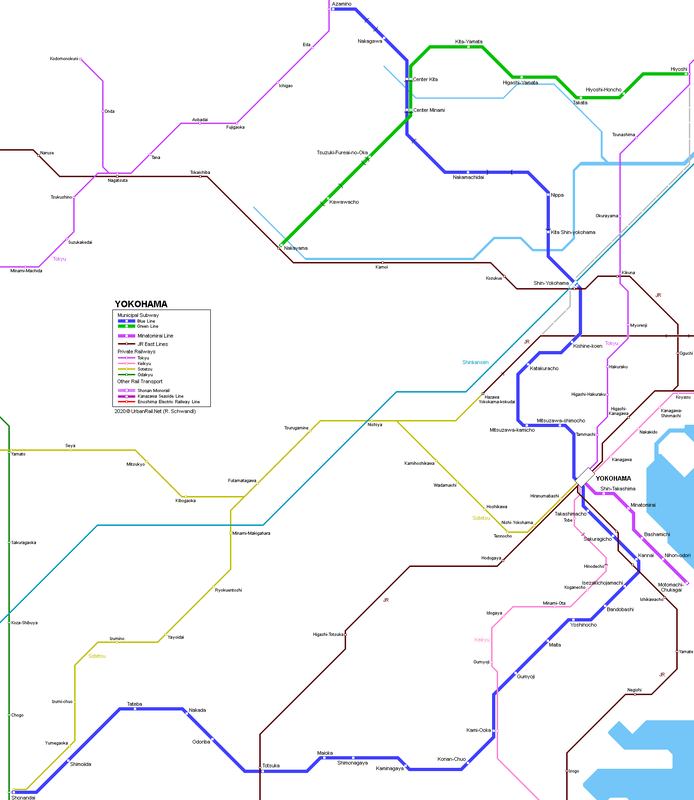 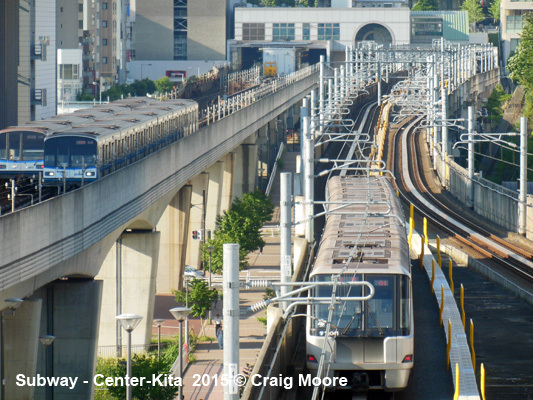 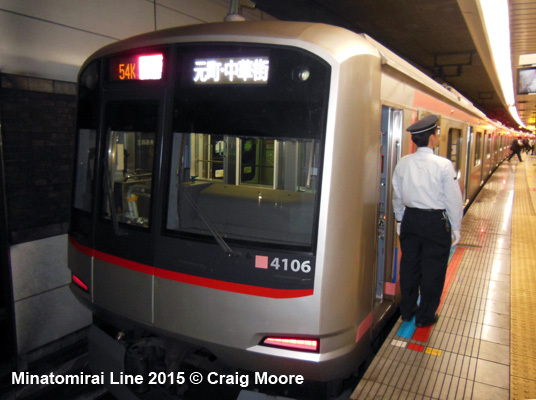 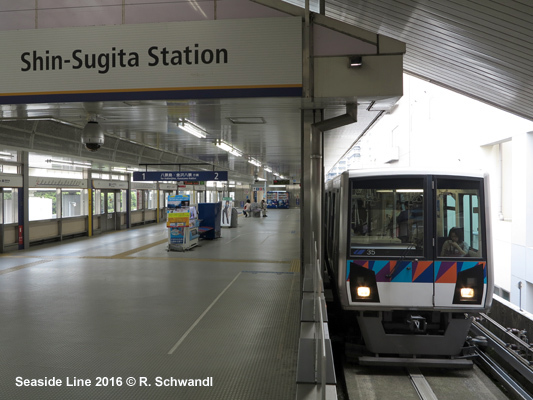 Yokohama has two real subway lines, which are complemented by several local railways that provide a high-frequency rail service also within the city (especially the Sotetsu and the Keikyu Lines). 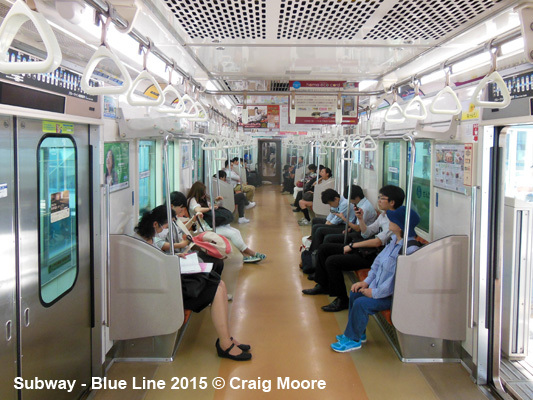 Subway construction began in 1968 on today's Blue Line, which was originally planned as two separate lines (Lines 1 and 3) meeting at Kannai. 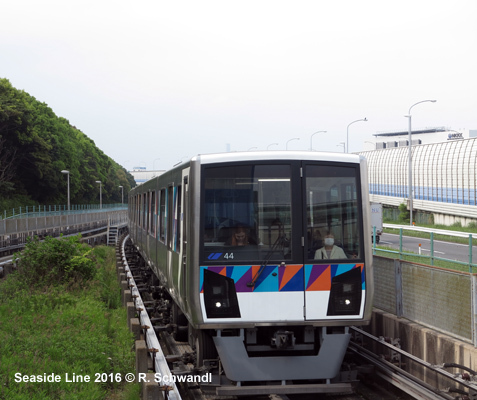 It is now operated as one continuous line that runs from Azamino in the north to Shonandai in the south. 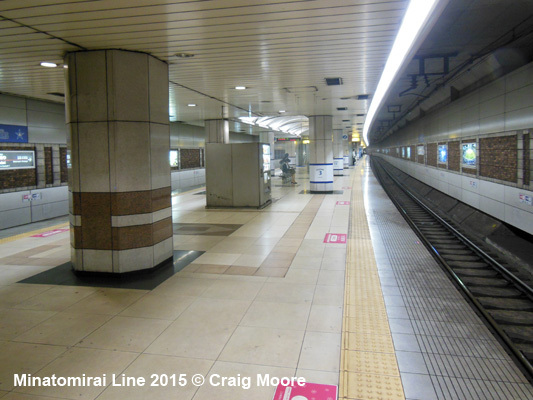 Most stations have 120 m long island platforms, 5 stations are on the surface (Center-Kita, Center-Minami, Nakamachidai, Nippa, Kaminagaya), average distance between stations is 1.3 km. 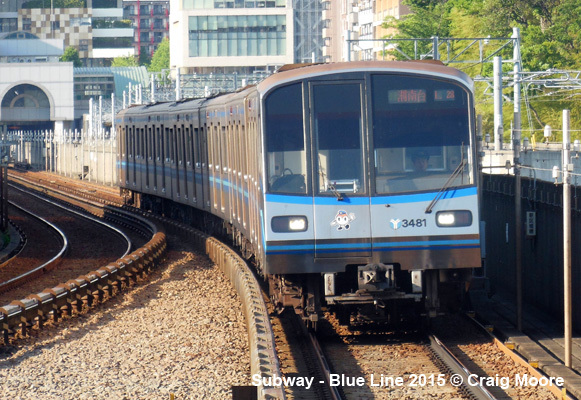 The line uses 1435 mm gauge, power supply is via a 750V third rail. 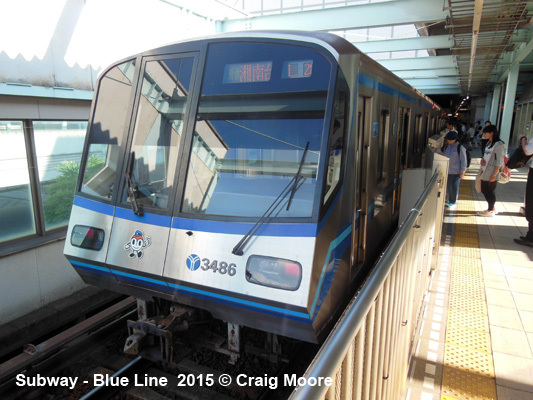 The 38 six-car trains (maximum in service on weekdays: 33) operate 159 runs on weekdays. 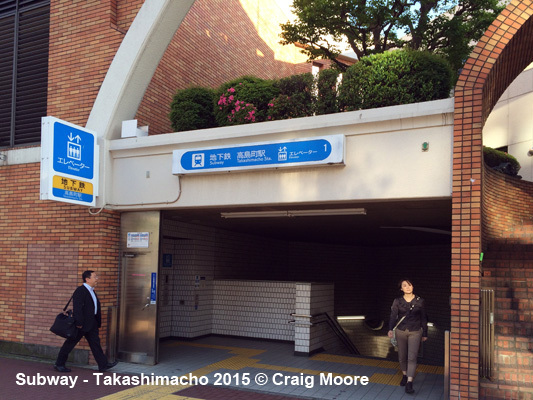 One trip from Azamino to Shonandai takes 66 minutes. 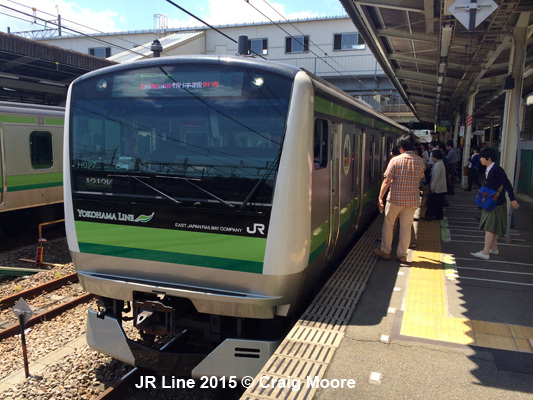 JR and Tokyu rail services to Tokyo leave from Yokohama Station, but the Shinkansen high speed service stops at Shin-Yokohama Station also served by the subway. 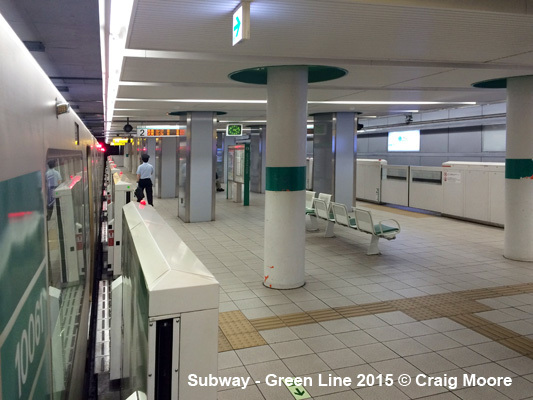 The Green Line (originally planned as Line 4) was added to the system in 2008 (Hiyoshi - Nakayama). 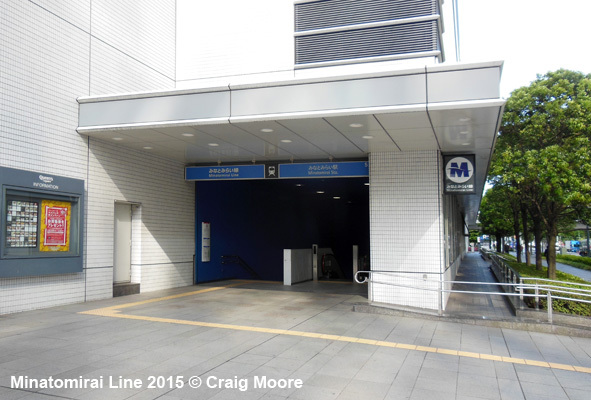 This could be the first part of a future ring line. 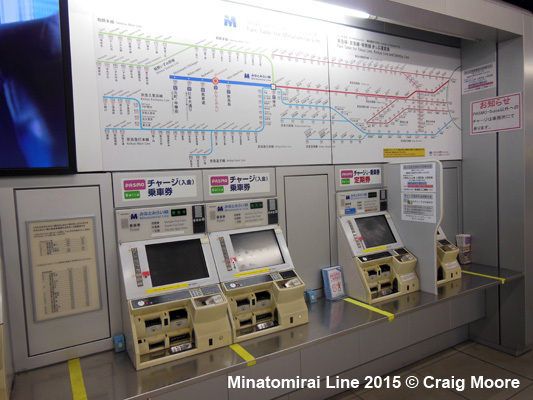 The Minatomirai Line runs from Yokohama Central Station along the new habourside development area. 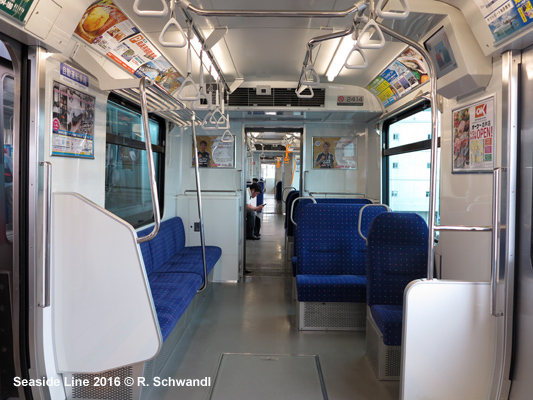 It is 4.1 km long and is operated jointly with the Tokyu Toyoko commuter railway, which runs from Yokohama to Shibuya in Tokyo (35 min). 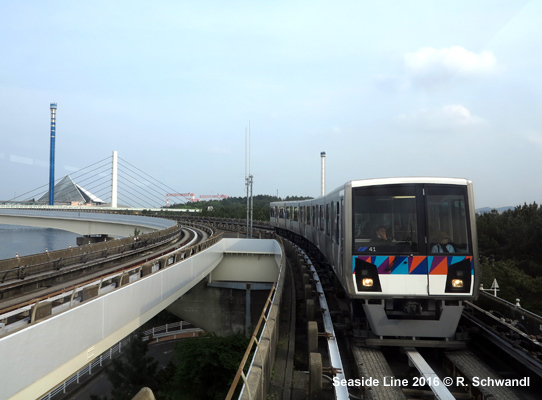 Along the Minatomirai Line, express and local trains are operated, with all trains stopping at Minatomirai and the terminus station Motomachi-Chukagai. 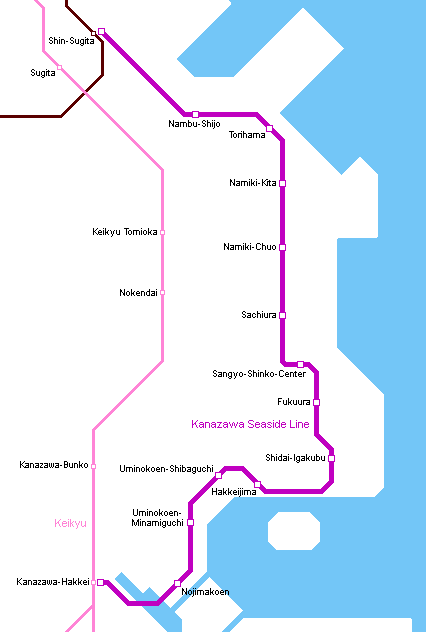 The Seaside Line (previously known as the 'Kanazawa Seaside Line') is a 10.6 km long elevated fully automated light rail line opened on 5 July 1989 and running south from Shin-Sugita JR Railway Station to Kanazawa-Hakkei station on the Keikyu Railway (see map) The line in fact is not finished since during construction final planned 0.9 km to Keikyu Kanazawa-Hakkei station has not been built, so the present Kanazawa-Hakkei station is a temporary one. 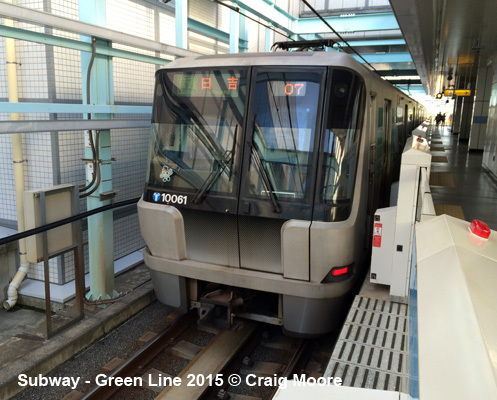 6.6 km suspended railway, some 15 km south of central Yokohama > view our Shonan page! 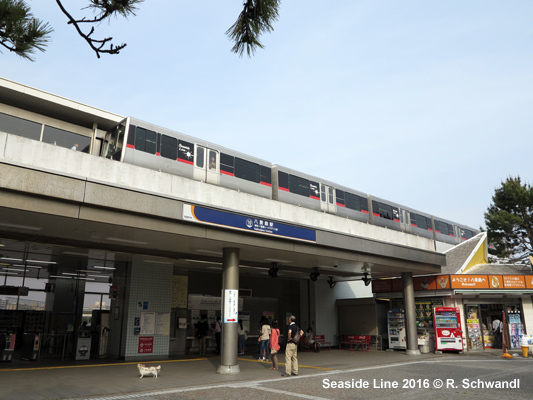 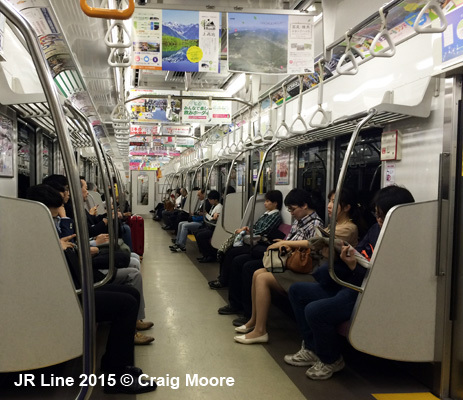 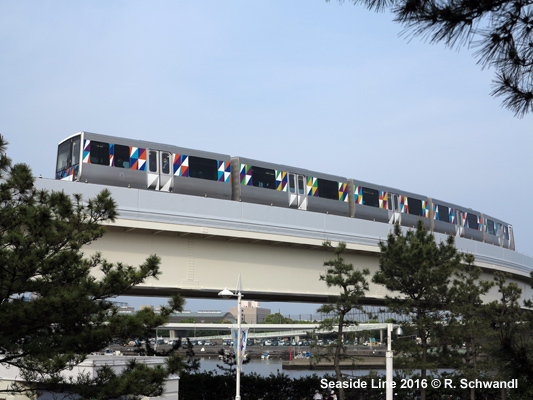 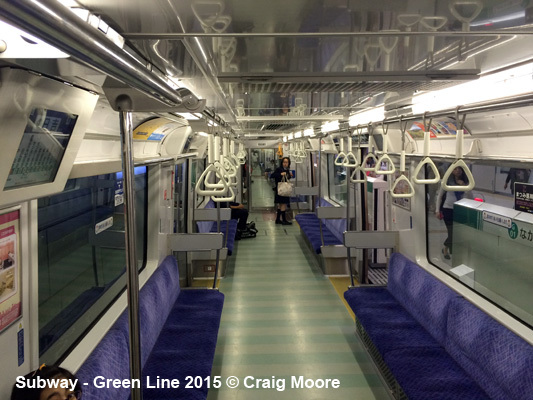 10 km light railway, linking with Shonan Monorail > view our Shonan page!